2018 has been quite a year for anniversaries, of international, national and local interest, from Armistice in November to the bicentenary of Clifton Club and the half centenary of the Clifton and Hotwells Improvement Society. In a joint effort the latter two collaborated with the unveiling of an informative green plaque on the Clifton Library building, where the Club was founded, to be replaced by Christchurch School and later Clifton Library. ​Remembrance of a personal and poignant kind arises from news of the death of three major figures in CHIS’s achievements: former Chairmen Haydn Mason and Mike Pascoe and long-standing committee member, Richard Bland. 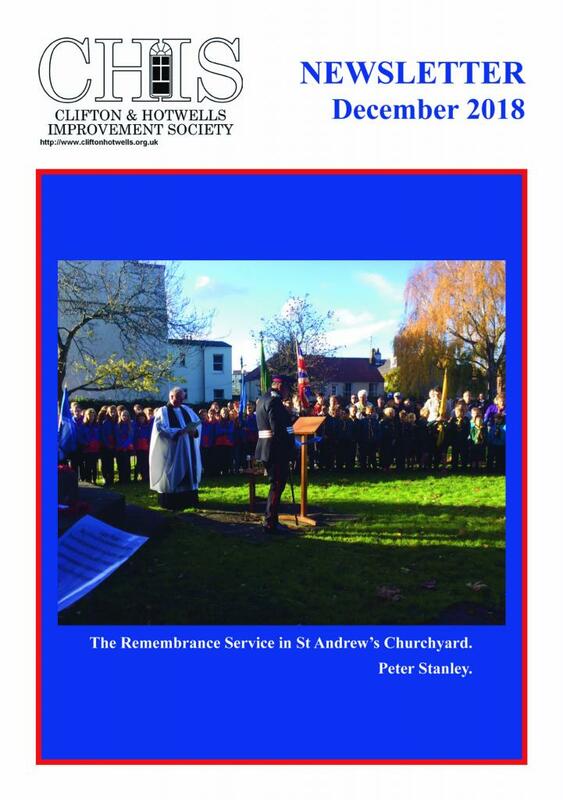 Peter Stanley has maintained Richard’s role in placing our poppy wreath at the Royal British Legion Remembrance Day Service at St Andrew’s Churchyard. A special feature was the sounding of the Last Post and Rally on a bugle once used on the Western Front. ​A loss of another sort is the resignation of Roger Snary, our Treasurer for the last 38 years. At the AGM tributes were paid to his outstanding service and loyalty. Efficiency and affability were his keynote, being invaluable when informing or correcting the Committee on financial procedures, sound budgeting and public body responsibility. Undeterred by needing to drive from Clutton in all weathers, he brought to our discussions a perspective which allied the insider to the supportive visitor. Members will have relished his succinct and informative Treasurer’s Reports at the AGMs. We acknowledged our debt to him at the recent meeting and presented an inscribed Bristol Blue Glass paperweight as a memento. Our gratitude for his work continues as he offers support in the vital task of seeking a successor. ​The Autumn Talks programme started with a highly scholarly and artistic survey by Francis Greenacre of Bristol’s Fallen Idol: the iconography of Edward Colston. Sensitive to the current controversies, the speaker enlightened and informed a 70-strong audience, appreciative of the talk but less so of the hitherto unknown occurrence: we ran out of wine! ​The AGM was also well attended and supplies were just adequate. Two committee members, Christopher Jefferies and Maggie Shapland, were re-elected for a three-year period. Our determination to kick off our second fifty years in fulfilling the aims of CHIS’s founders was asserted by the vow to campaign in every effective way to ensure that any building on the former W.H. Smith site on Clifton Down Road is worthy of it its location amid countless listed buildings. ​The need was by coincidence enforced in one of three fascinating films by Gordon Young; it traced the route by which demolitions of fine terraces and gardens would be inflicted to build the Inner Relief Road. A return of that philistinism of the 60s and 70s must be prevented. ​The talks season closed on November 20th with one that might please Prince Charles: Urban Peregrines by Ed Drewitt. With dazzling enthusiasm, detail and brilliant illustrations of these raptors and the remarkable increase in their numbers the speaker enthused the many listeners. ​Details of the 2019 programme, beginning on January 22nd, are enclosed. ​Some members have asked whether microphones might be used; we are seeking advice on a reliable system. ​In wonderful summery weather our visit to Bletchley Park, previously so popular that RoseMary Musgrave obligingly arranged a repeat, was a stunning success: such calculating genius was on display, it staggered realisation. ​The Green Squares and Secret Gardens Weekend, initiated five years ago by RoseMary Musgrave, with the support of CHIS, attracts more visitors each year. They come from Bristol and beyond to enjoy an ever-growing number of gardens. On a high note, therefore, the organization of the weekend is to be taken on by a committee of garden representatives, who no doubt will maintain the range and interest of the many gardens and squares with which we are blest. ​We plan to put information or interpretation boards at places of interest and the committee is exploring designs as well as consulting interested parties. So too with signage in Clifton Village. That nomenclature is quite recent and has stuck. Imagine how bizarre therefore for Bristol University to refer to these “villages” in the BS8 area as part of its student care management. Our complaint about resulting confusion got no helpful response. ​Planning details appear later in the Newsletter. We welcome recent decisions by Bristol City Council to refuse retrospective applications for what are often unacceptable alterations in a Conservation Area e.g. demolition of walls or installations of PVC windows. It is good to see the fountains by the Victoria Rooms flowing again. ​As ever, refuse in the streets is an offensive presence, most recently at Royal York Crescent, and ever-present and worse, at the western end of Alma VILE Road. New legislation which makes owners of HMOs (houses of multiple occupation) responsible for tenants’ rubbish offences will, we hope, have effect. ​On a general note, we are among the 85% of respondents who object to the City’s Tall Buildings proposals, regretting that the “consultation” was near to being a charade. Look at what two successive Mayors have allowed to be done to London.